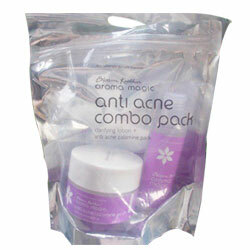 Buy Aroma Magic Anti Acne Combo Pack - Clarifying Lotion + Anti Acne Calamine Pack - Treats Acne, Removes Blemishes & Unclog Pores. Directions for use of Aroma Magic Anti Acne Combo Pack. Mix the contents of one sachet of Anti Acne Calamine Pack with the required amount of Clarifying Lotion to make a paste. Apply an even layer on the face and neck, and leave it on for 15-20 minutes. Wipe or rinse off gently with water. For best results, use twice a week.